What I learned from my failure to flunk an “amateur” college football star. The news that a Heisman trophy winner, Johnny Manziel, will be suspended for one half of one game because he sold his autograph has revived an old debate: should college athletes in marquee sports be paid? Does it make any sense to think of them as “amateurs”? I must, alas, leave the technical discussion to better-informed interlocutors. All I have to offer is an anecdote. Maybe it will help people think some things through. Our story begins in 1992, when your humble correspondent matriculated as an exceptionally neurotic graduate student at the football and, um, American Studies powerhouse the University of Michigan. Entirely unqualified and unprepared to teach, I was nonetheless thrown to the wolves as a freshman composition instructor. On the first day of class, I had gotten through the introductions, passed out the syllabus, and launched into explaining the course, when a strapping, tall, god-like young man walked into the room—very late. All other activity stopped. I couldn’t teach any more for the murmuring. A star of the University Michigan football team would be practicing the farce of pretending he was a college student in my very own classroom. It turned out to be quite the education for me. Because most of us first-year graduate students had no idea what we were doing in the classroom, we taught freshman composition using a pedagogy-less “workshop” method (and that’s a subject worth writing about another time). A designated student would bring in a draft of the paper to hand out to the class. The students would read it as homework, and the next class session would be taken up by their discussion of how it could be made better. Early class sessions, however, were largely taken up by the kids being broken up into small groups and doing writing exercises out in the hall. But I had to stop doing that. All my students would end up doing once outside of my gaze was crowd around the Football Star and harass him for what Johnny Manziel was accused of selling: autographs. Anyway, one fine fall day, it was Football Star’s turn to show up with his draft of an essay. I obviously had to fail Football Star for that section of the class. If I could have done worse than fail him, I would have done that as well. Because since I had no material to “teach,” the next class session had to be cancelled entirely. Next chapter in the story: I get a call from the guy at the athletic department whose job is it to liaison with professors. I’m ashamed of what happened next. He laid on me a sob story about how Football Star came from a rough ghetto, grew up in a housing project, didn’t get any breaks, etc. That this was his one shot at a college education. Something to fall back on, in case this football thing didn’t work. And me, being a dopey neurotic weak-willed 23-year-old, packed to the gills with liberal guilt to boot, listened to him try to persuade me to give Football Star another chance—and of course I said yes. He brought a draft of a paper to my office hours. To the moral credit of the University of Michigan athletic department, he did actually seem to have written the thing. That much was obvious: it was barely literate. I should have made a photocopy and kept it. Football Star went on to help lead the Wolverines to the Big Ten championship that year, then the Rose Bowl, setting records at his position. What happened next? Thanks to Wikipedia, I was able to find out. The 1996 NFL draft was a quality one for his position. So he only went in the fifth round. He played in seven games in his first professional year—and only four in his second. He was traded away to another team before his third season—where he played in only two games. The next year he joined another team’s practice squad—then was released nineteen days later. He lasted five weeks on a professional team in Europe. Then signed with a Canadian team. Things looked promising in the pre-season and early regular season games—then he got hurt, and was released in September. Two years later he tried a comeback with a team in Arena Football’s developmental league. The league was short-lived; so was the career within it of my former “student.” Then, after the section reading “Professional career” on his Wikipedia page, there is nothing—because what happened next apparently matters to no one. I checked Nexis-Lexis. Also nothing, of course; once his usefulness as a revenue-and/or-glory-generating unit had dried up, he was invisible to the world. I wonder where he is now. Maybe he’s happy, productive, secure, thoughtful, wise—I hope so. Anyway I’d like to find him. And apologize to him. Apologize for not flunking him. Maybe, then, I could have actually taught him something in that class: you get to evade the rules everyone else has to follow only as long as you are a god. And you get to be a god only when you’re worth something to the people who are using you. 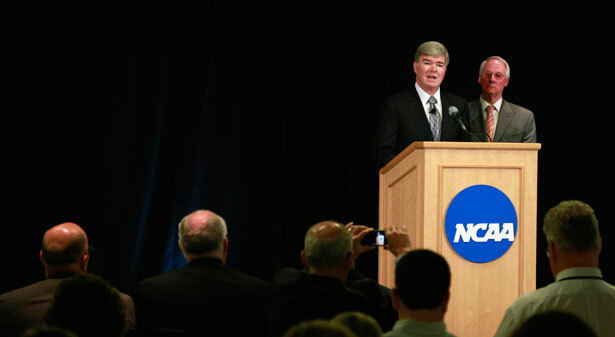 Dave Zirin admonishes the corrupt and exploitative practices of the NCAA.